Renowned leader & Ex. M.P. 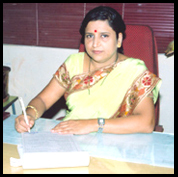 late Honourable Mrs. Kesharbai Sonajirao Kshirsagar Alias Kaku established Navgan Shikshan Sanstha Rajuri’s Mrs. K.S.K. Alias Kaku Arts, Science & Commerce College in 1971. She was a great visionary & always thoughtful about the poor & downtrodden people of this backward area. The students of this region from poor & backward families should get quality higher education was the intension behind establishment of this institution. This college was started with 215 students & today near about 4000 students are learning in the college. Since the beginning it is the practice to impart quality education for the students. Students & Faculties of our college have been achieving various milestones & doing well in curricular & Co-curricular activities. Outgoing merit students & competent human beings for betterment of society is our success. The college has been reaccredited by NAAC with ‘A’ grade having (3.18 CGPA) in Nov. 2018 as per new RAF. The college is certified with ISO 9001:2015. The college is focusing on the students of this backward region to move from darkness to enlighten the future & doing well efforts in this regard.